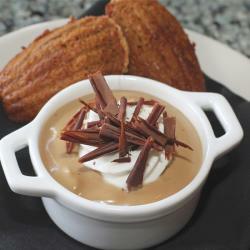 Delight your palate with Salty&apos;s extravagant butterscotch pudding. This dessert gets its unique flavor from Dewar’s Scotch and Muscavado sugar, which is unrefined brown sugar with a strong molasses flavor. Topped with Chantilly cream and shaved bittersweet chocolate, this dessert finishes off with a soft and crunchy ginger crumble cake baked in a madeleine cookie mold! In a heavy bottom sauce pan combine whipping cream, sugars, starch and salt. In a separate bowl combine milk and egg yolks and whisk. Have vanilla, scotch and butter ready. Slowly bring the first mixture to a boil, whisking quickly and continuously. The mixture will get frothy but will lose the foam once it starts to thicken. Once it starts to bubble, continue to whisk for 2 minutes. Turn off the heat and quickly whisk in the egg-milk mixture. Turn the heat back on and bring the mixture back to a boil, whisking quickly and continuously. Once it is bubbling, turn off heat and whisk in vanilla, scotch and butter. Blend very well with an immersion blender (it will change color and turn lighter). Strain into 6-ounce serving containers and chill in an ice bath uncovered until cold. Remove containers from ice bath and refrigerate at least 8 hours or overnight. In the bowl of an electric mixer cream butter and brown sugar until light and fluffy. Add ginger and continue to mix for 30 seconds on medium low. Add eggs one at a time and scrape in between. Sift dry ingredients in a bowl and mix sour cream and buttermilk in another bowl until well blended. Alternate wet and dry ingredients into butter-sugar mixture and give the batter one last scrape and then mix an additional 30 seconds. Combine all ingredients in a bowl and work together with your fingers. Spray a silicone Madeleine mold and spoon in some batter, filling about half way. Sprinkle with a little crumble and batter to fill mold. Bake in a 350 degree F oven 15 minutes testing with a toothpick. Transfer to a wire rack and cool slightly. Serve when still warm. To serve use a dollop of whipping cream in middle of serving dish and sprinkle with chocolate shavings.